"The Demon Apostle (Part 3 of 3)"
R.A. Salvatore created a world of fantasy in which the magicks rested in gemstones, the elves trained one ranger in each generation to protect the forests and people of the outlying areas of the kingdom of Honce-the-Bear, and the Abellican church seeks power over the the state. In this magical Land of Corona, wherein lies Honce-the-Bear, there are many mythical and magical creatures; elves, centaurs, dwarves, giants, and goblins, but the enemy of man turns out to be none of these. Instead man's worst enemy is himself, especially in the form of Religion and Politics. 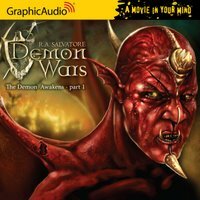 GraphicAudio has produced the first three books in Salvatore's "Demon Wars Saga" and this audio book brings to a close the third book in the first trilogy of the Demon Wars. Each book in the trilogy has been divided into three parts making it, in my opinion, easier to consume the "Movie In Your Mind" production. While each segment leaves you ready to dive into the next installment, with the superb sound effects, music and acting, the mind needs the intermission. If only enough time to grab more popcorn and begin the next. In this final section of the final book of the first trilogy of "The Demon Wars Saga," Elbryan the Ranger, Bradwarden the centaur and Roger Lockless have escorted 5 Abellican monks to Mount Aida on a quest to view the place where the renegade Abellican monk-named-heretic, Avelyn Desbris died defeating the demon dactyl Bestesbulzibar. This battle, while defeating the physical form of the demon, released the demon's spirit so it could possess the father of the Abellican Church Father Abbott Markwart. Markwart has, under possession of the demon, has turned the church in a direction away from God and the young monks wish to turn the Church back by possibly canonizing Avelyn. Markwart will do all he can to stop this. Back in Palmaris, one of the major cities of Honce-the-Bear, Elbryan's wife and disciple of Avelyn (she can battle with the best and use the magic of the gemstones), Pony, is pregnant with Elbryan's child and in hiding. When Father Abbott Markwart pays a political visit to Palmaris, Pony tries to exact revenge on the man who killed her adopted parents by attempting to assassinate Markwart throught he magic of the gemstones. Her plot seems to have succeed by sending a lodestone through Markwart's skull, but to the amazement of the monks the father abbot survives. He now seeks revenge on Pony. In a battle between the spirits of Pony and Markwart, Markwart removes the baby from Pony. Pony believes the baby to be killed but the elves Belli'mar Juraviel and queen of the elves, Lady Dasselrond, take the baby back to the elven lands. These events all come to their apex in a battle between the powerful Markwart and the spirit of the demon within and Elbryan and Pony. With superb sound effects in this production you will easily lose yourself in the land of Corona and the magical battles within. 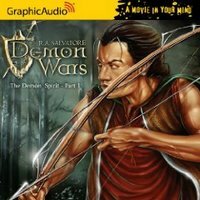 "The Demon Spirit Part 3"
Part 3 of "The Demon Spirit" audio book brings to a close the second book of R.A. Salvatore's The Demon Wars Saga, and running the risk of making this review too short, this book in the 7 book series ends with an extreme cliffhanger. To recap the story thus far in a nutshell: the Demon Dactyl awakened and was defeated by a Ranger, Warrior, Wizard, Centaur and Elf before he could take over the land of corona. The Wizard was a holy man known as Avelyn Desbris from the Abellican Church who after leaving the church was hunted down for "stealing" the magic gemstones. Avelyn's mentor discovered Avelyn was not the heretic the Father Abbot Markwart set him out to be, but rather a saint that saved the land. The Centaur, Bradwarden, is discovered alive and the church tries to torture him into confessing that Avelyn was a heretic. The Ranger, Elbryan and the Warrior, Pony, continue fighting giants, goblins and dwarves (leftover from the Dactyl's armies) to save the commonfolk in the land of Corona. I guess that sums up the last book and 2/3 worth of material that makes this captivating saga. To close out "The Demon Spirit" book there are lots more deceits and heroism to keep this series well worth investing your time. Elbryan and Pony have grown closer and have become officially married. They, however, put off having children until all the enemies of Corona have been defeated and the land is once again safe. In protecting the land they become targets for the evil Father Abbot Markwart and his assassins named Brothers Justice. Markwart hears of magics being used in the northlands and knows the magic can only be performed using the gemstones "stolen" by Avelyn Desbris. Markwart arrives in Pony's hometown and arranges for the murder of the Abbot of the local church. Markwart also schemes to get back the stolen gemstones from Pony. One of his servants, Marcalo De'Unnero, uses his exceptional training in the martial arts to create two new Brothers Justice to find the woman and the gemstones and deal with them both. Markwart adds Pony's adopted parents to the torture chambers with the Centaur Bradwarden and attempts to torture them to find Pony as well as have them become allies in the making of Avelyn a heretic. The Church no longer has a solid foundation, however. Master Jojonah is a high-ranking member of the Church and a former teacher of Avelyn Desbris, begins to see the rot in their beloved institution and works quietly to bring about the truth of Avelyn. This work eventually leads Jojonah leading Elbryan, Pony, and the elf, Juraviel to the dungeons to free the captives. As I said earlier in this review, R.A. Salvatore ended this book with a massive cliffhanger, that leaves you wondering, will the church survive and in what incarnation? The best part of listening to this series in audiobook form is that it is produced by GraphicAudio. With GraphicAudio's "movie in your mind" approach, listening to these books can make you feel as though you are launched into the magical/mythical land of Corona and sitting alongside watching the story unfold. The acting is superb, the sound effects are ultra-realistic and the incidental music helps shape the moods of the story. Bravo GraphicAudio. "The Demon Spirit - Part 2"
R.A. Salvatore created a phenom in the Demon Wars Saga, spanning seven books and a role playing game. This saga of high fantasy in the Land of Corona is one of action and adventure equal to that of the "Lord of the Rings" trilogy by Tolkien. In the first book, which Graphic Audio produced in audio form in three parts, the listener was introduced to the Heroes; Elbryan the Ranger, Jilesponie the warrior and wizard in training, Avelyn Desbris the Wizard Monk, Bradwarden the Centaur and Juravial the elf. The all went to battle the Demon Dactyl which had awakened and sent it's armies of dwarves/powries, goblins and giants into the Land of Corona to clear the way for the Demon to take command. Avelyn and Bradwarden and many humans lost their lives in destroying the Demon Dactyl and Elbryan and Pony returned to the humans in hopes the evil was gone. "The Demon Spirit - part 2" continues with Elbryan, Pony and the elf, Juraviel trying their best to rid the land of Corona of Fomorian Giants, Bloody-Cap powrie dwarves and goblins. This time they run into the generals of the powries and giants and decide to destroy those higher ranking officials in hopes that without leaders the powries and giants will leave the lands and the goblins will soon follow suit. The battles ensue and when it looks like a major victory for the humans a problem arises. This problem is from one of its own. A thief turned hero by the name of Roger Lockless is Jealous of Elbryan, otherwise known as the ranger Nightbird. On the other side of the land the Abellican Church led by Father Abbot Markwart have found and are torturing the Centaur Bradwarden. Yes Bradwarden lives! Markwart is out to make the hero Avelin Desbris, who gave his life destroying the demon dactyl, seem as though he joined the dactyl and died deceiving the humans. Master Jojonah knows different and begins to see that the Church is turning into a very dark force. Pony's adopted parents are held captive by Father Markwart in hopes to find the stolen magic stones of Pimaninicut which Avelin had "stolen." Pony's Ex-Husband, the nobleman Conner Bildeborough, learns of this and seeks out Pony, known to him as Jilly, to warn her of the danger. Once again GraphicAudio continues the "Movie in your mind" tale in the audio book with great acting and production. This time around I found myself fascinated by the sound effects of the horses. All sound effects of the horses in this production are perfectly placed. When they need to run they run when they stop they stop. During one battle it sounds as though they recorded an actual horse stomping in the skull of an actual giant. Very realistic. Giants don't really exist do they? 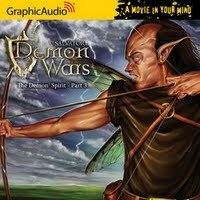 "The Demon Spirit - Part 1"
Graphic Audio once again will knock you out of your socks with their superb audio production of this audio book. From the swords clanging to giant's skulls being bashed in to the screams of goblin agonies, Graphic Audio makes all the moments of battle or peace in this audio book seem as if they were recorded live and on the spot, placing you in the center of the action. "The Demon Spirit - Part 1" tells the story of how after destroying the Demon Dactyl, Elbryan and Pony set off to return to their homeland hoping that the end of the Dactyl means the end of evil on the land. This is not the case, instead the armies of the Dactyl are now scattered throughout the land of Corona with no leader. The armies, giants and dwarves are wreaking havoc on the land. Elbryan and Pony meet up with Juraviel the elf and he tells them of how the Dactyl may have ruined the lands of the elves forever and that the humans could lose the battles with the leftover armies of the Dactyl. They then team up and decide to rid the land of the Demon Spirit left behind. In the meantime the monks of St.-Mere-Abelle still believe that Avelyn Desbris has become in legion with the Dactyl and the monks set out to destroy Avelyn not knowing that he was the hero who destroyed the Dactyl. The monks head to the Barbicon and Mount Aida to recover the magic gemstones Avelyn stole from the monestary and to destroy Avelyn. When they arrive at the Barbicon a different story is told in the destruction that is found. But it seems the Demon Spirit has infiltrated the monks and maybe they don't want the truth to be know. Great Production, Great acting and most of all a great story make this yet another Graphic Audio Production to seek out and enjoy. "The Demon Awakens - Part 3"
The beginning of a new era comes to a close in part three of the high fantasy saga, The Demon Wars, by R. A. Salvatore. The demon Dactyl has awakened and has put together an army to destroy the land of Corona. The army is invading the towns and villages of Corona and the humans are slowly overcoming their denial and under the tutelage of Elbryan, Pony, Avelyn and Bradwarden and beginning to fight back. R.A. Salvatore has created a story that runs through seven books and is the basis of the role-playing game, Demon Wars. Now teamed up with Graphic Audio, these books come to life as an audio adaptation. In order to do justice to the books, Graphic Audio is producing each title of the series in multiple parts. This is the third of three parts which make up the first title, The Demon Awakens. Once the villagers and townsfolk experience for themselves the devastation brought on by armies of goblins, powries and giants they realize the warnings have been true. Elbryan the Ranger, Pony the warrior and wizard in training, Avelyn (the Mad Monk) the Wizard and Bradwarden the centaur have trained some of the remaining humans in how to fight back against these foes. Once the humans are able to somewhat fend for themselves, the trainers must take on their own quest and leave for the Demon Dactyl's lair in Mount Aida to defeat Bestesbulzibar, the Dactyl himself. This audio book is filled with numerous battle scenes and skirmishes and once again Graphic Audio has produced the "Movie in your Mind" with such talent and ambiance that the actual battles become more than real in this listening experience. Not to give anything away but when the heroes arrive at Mount Aida the volcano in the mountain and all the creatures defending the Demon Dactyl's throne come alive and the listener easily becomes lost in this epic battle. Graphic Audio not only provides great voice talent but the sound effects and ambient music are a bit of wizardry in themselves. This audio book should be on any an well respected fantasy fan, and should be added to those who love great adventure. 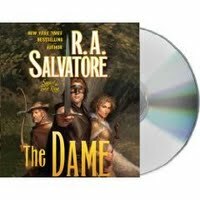 R. A. Salvatore has taken the fantasy realm and added some nice bonuses. The wizards in this realm are monks that use a variety of gems, crystals and stones to perform their magic. Each stone has its own power and Salvatore has made the magic within seem almost obvious and yet still maintain the creativity within their use. Bradwarden the centaur has to be my favorite character, not only is he strong, smart and musically inclined with the bagpipes, but he also has a wit that creates a perfect fit within the group of heroes attempting to defeat the evil invading their land. Oh yeah, and he sometimes eats his victims. The beginning of a new era continues in part two of the high fantasy saga, The Demon Wars, by R. A. Salvatore. The demon Dactyl has awakened and has put together an army to destroy the land of Corona. R.A. Salvatore has created a story that runs through seven books and is the basis of the role-playing game, Demon Wars. Now teamed up with Graphic Audio, these books come to life as an audio adaptation. In order to do justice to the books, Graphic Audio is producing each title of the series in multiple parts. This is the second of three parts which make up the first title, The Demon Awakens. Once again Graphic Audio delivers, with a punch, another "Movie in your Mind," with great production. Using a well cast multi-cast performance and incidental music the story is told superbly. Another feature of all Graphic Audio productions continues in this production and that is the very realistic sound effects. In part one of this series the listener was introduced to Elbryan, Jilsesponie (Pony) and Avelyn Desbris. Elbryan and Jilsesponie are the only survivors of the goblin raid on their village of Dundalis. and Avelyn Desbris is a monk that has lost faith, not in God, but in religion. Elbryan was taken in by the elves and trained to become a ranger and set out to guard the region from dangers. During this training Elbryan learned to fight and how to find his spirit guide. After years of conditioning his body and mind the elves tell him it is time to leave them. He finds himself protecting the region even if the locals don't feel they need protection. Elbryan also finds himself back in his hometown of Dundalis. This is not the Dundalis of Elbryan's youth but one that has been built upon the ruins of Elbryan's Dundalis. Elbryan is befriended by a bag-pipe playing, wise-cracking, Centaur who helps Elbryan find a horse and continues his training. Pony has had the hard life thrust upon her mainly due to her not remembering who she was or where she came from. She finds herself married to a noble man but on their wedding night she attacks him out of fear and the marriage is annulled. At this time she remembers her name is Jilsesponie and becomes a soldier set to guard the region. Her fellow soldiers continuously shun their duties for drink and the company of women (Pony is the only woman in the fort). Pony soon becomes the only one aware of an attack by vicious dwarves known as Red Caps (they get their nickname because of their ritual of dipping their caps into the blood of their slain enemies). Pony escapes the attack after destroying the Red Cap Ship and her life then intersects with Avelyn Desbris. Avelyn has lost faith in the Abellican Church after returning from gathering magic stones. Gems and stones hold power in the land of Corona and the abby is the only one able to gather the stones dropped from heaven. When the monks return from the gathering of the stones the abbey orders the destruction of the sailors and the ship that took the monks to the island. Avelyn witnesses this senseless murder, takes the stones gathered and leaves the Abellican Church forever. However, before he leaves he kills one of the monks in charge and is now a fugitive. A bounty hunter , of sorts, is trained to hunt down and kill Avelyn and sent out to find him. Avelyn, through a vision, discovers the Dactyl has awakened and will soon destroy the land of Corona. He then takes it as his mission to warn all the villages he can by going to village pubs and preaching the end of the world. This turns out to always end in a bar brawl which Avelyn always loses. These brawls are what Avelyn calls "readiness training," because the villagers all learn to fight. After being thrown out of the pub which serviced Pony's fort and soldiers, Pony befriends the wayward monk. Pony meets up with Avelyn being thrown out again after she escapes from sure death in the Red Cap raid. Avelyn and Pony develop a friendship and Avelyn takes it upon himself to return Pony to her homeland so she can deal with her demons and heal. Upon returning to Dundalis many things happen to the trio as this book winds up in preparation for the final installment in Graphic Audio's production of "The Demon Awakens." This production has it all danger, excitement, battles and fun. It’s a beginning of a new era in part one of the high fantasy saga of the Demon Wars by R. A. Salvatore. The Demon Dactyl awakens and begins to put together an army to destroy the land of Corona. 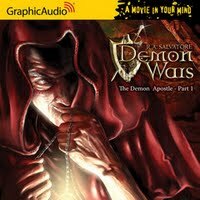 R.A. Salvatore created a saga that runs through seven books and is the basis of the role-playing game “Demon Wars.” Now teamed up with Graphic Audio these books come to life as “A Movie in Your Mind.” In order to do justice to the books Graphic Audio is producing the saga in parts. The First book “The Demon Awakens” begins with this part one audio book. To start the book off the demon “Dactyl” awakens and the sounds of his coming back to life after spending an eon encased in stone are extremely well done. 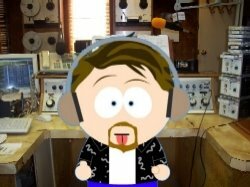 The creative staff at Graphic Audio bring to life the sounds of this awakening. 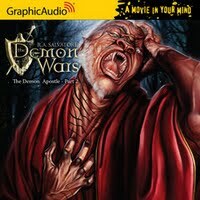 In “The Demon Awakens – part one” the listener is introduced to the main characters of book one. Elbryan and Jilsesponie (Pony) are a couple of 13 year-olds that live in the village of Dundalis. They go out to welcome back the village’s hunters as they come back from their annual big hunt. To their shock one of the kills being carried is a goblin. This brings horror and awe to the minds of the villagers as goblins have been unheard from in so long that many of the villagers don’t know anything about this race of evil beings. Elbryan and Pony seem to be just falling in love in this peaceful time in the land of Corona. But just as they begin to explore this love their village is attacked by a goblin and giant raiding party. Elbryan and Pony are separated as their village is destroyed, each one believing they are sole survivors. Once again the audio production quality along with the music will put you on the edge of your seat as you hear the village being destroyed and the villagers fighting back. After the destruction of Dundalis, Elbryan is followed by some elves that have a history with his family. He is taken in by these elves to be trained as a ranger. This training will continue until Elbryan is strong enough and skilled enough to defeat the strongest elf in the clan. Pony has more of a dark future ahead of her. She is found wandering and dirty in a nearby village and without memory of the attack on Dundalis or her past. She is taken in by a couple of colorful pub keepers who give her the name of Cat deStray, where she is employed in the pub as a barmaid. Pony/ Cat is not fond of the unwelcome approaches by the pub’s patrons and at one point is cornered by 3 drunkards who are upset that she turned them down. In a quick brawl she defeats the 3 drunks to many of the people’s surprise. Another main character introduced is Avelyn Desbris, a freshly graduated monk who is taught the magic of the stones that fall from the “Halo” that surrounds the planet. The “Halo” at given times in history drops the stones from the sky and only special monks are allowed to gather the stones and wield their power. Each stone is capable of different powers, and to the surprise of the abbots Avelyn is the most powerful wielder of the stones they’ve seen. Avelyn is chosen to gather the stones, and is sent with other monks to an island which only certain religious leaders know of. Avelyn is a very spiritual monk that begins to question not his faith but the religion itself during his journey to the island. This book introduces the characters with some great fight scenes either between humans and goblins, giants, dwarves, elves or other humans. The production of Graphic Audio puts you in the middle of the fight hearing and maybe sometimes feeling the punches, sword slashes or arrow hits. You might actually want to check for bruises.